Oh no! 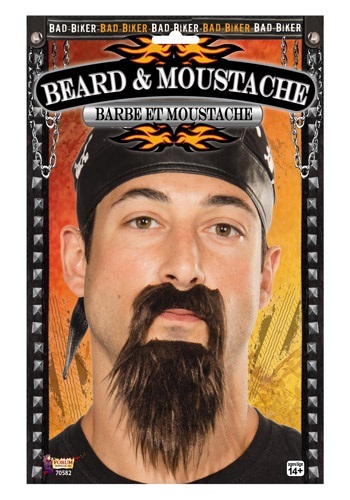 Halloween is right around the corner and you don't have enough time to grow out that perfect biker facial hair. Well jeez, now no one will take you seriously as a member of a biker gang with this blatant lack of fuzz on your face. But hey, before you kick yourself for not being more prepared (it happens to the best of us) just know that we are here to help! With this Biker Beard & Moustache, no one will think twice when you tell them that you roll with the rowdiest rough riders this side of the Mississippi. All you need now is an awesome skull bandanna, some killer shades, and a few good stories from your time on the open road, then the biker character you've created is complete! An actual motorcycle may help to add a little more authenticity as well... but if you don't have (or really want) one, then this facial accessory is sure to be the perfect finishing touch to any biker or tough guy costume.